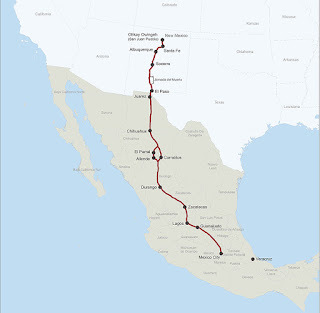 For more than two centuries, from 1598 to 1882, the 1,600-mile long El Camino Real de Tierra Adentro [“The Royal Road of the Interior”] was the main line of communication and trade between the Spanish government in Mexico City and its distant frontier outpost of New Mexico and its Capital City of Santa Fe. Literally everything the people of New Mexico needed that they could not produce themselves had to be transported over this vital link to the outside world. 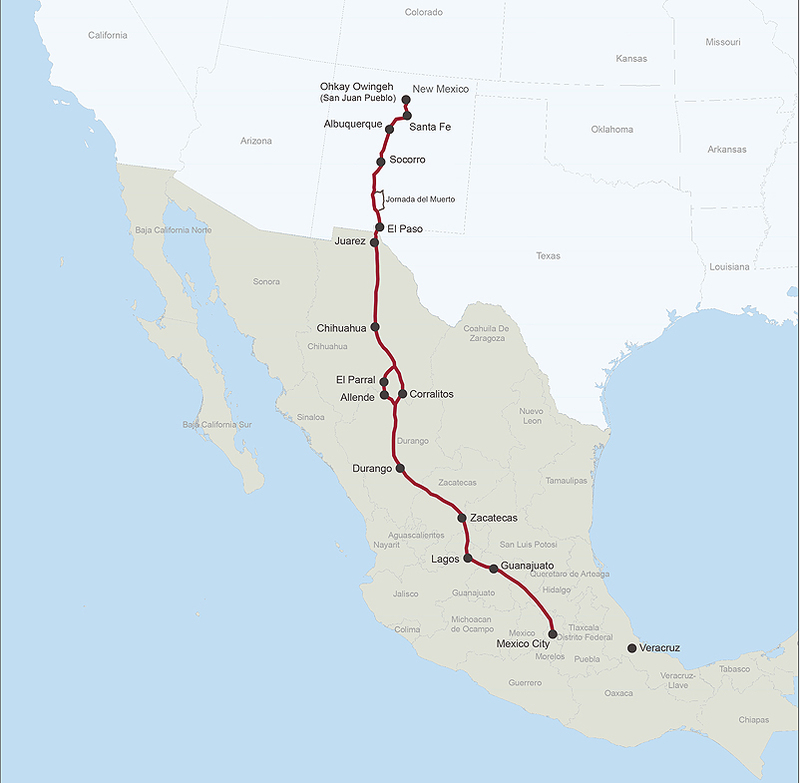 So to have an historical connection, however tenuous, to this route without which New Mexico would not be what it is today – would be pretty cool. So today’s question is, “Did El Camino Royal pass through what today is called Rancho Viejo?” – the 23,000-acre (39 square mile) parcel of land in southern Santa Fe County, which contains the HOA community in which Marsha and I now live. In 1582 Fray Bernardo Beltran and Antonio de Espejo led an expedition to New Mexico in search of Fray Agustin Rodrigues and his fellow priests who one year earlier had gone north from Mexico to explore the region traveled initially by Vasquez de Coronado in 1540. Many of the priests of the 1581 odyssey were killed en route. Fray Rodrigues and another cleric chose to stay to try and convert the Indians – but both disappeared and Beltran and Espejo failed to find any traces of either of them. The report of Beltran’s and Espejo’s travels is credited with the first official use of the term "La Nuevo Mexico" to describe the area – as well as being the first to enter this region with wagons. In 1598, Don Juan de Onate followed these wheel tracks as he traveled northward to become Nuevo Mexico’s first governor in its initial capital at San Gabriel de Yungue-Ouinge, just west of present-day Ohkay Owingeh where the Rio Chama meets the Rio Grande. “Every two or three years, a supply train composed of several dozen wagons loaded with supplies would head north towards Santa Fe, nearly sixteen-hundred miles away. These sturdy, four-wheel vehicles were pulled by teams of up to eight mules or oxen and carried food items that were not grown in New Mexico, including sugar and olive oil for cooking as well as welcome treats such as chocolate. Transportation of many other items of Spanish material culture, such as paper, cloth, shoes, medicine, musical instruments, barrels of sacramental wine, iron, gunpowder, and other supplies needed by the mission churches and the Spanish colonists, made the royal road an important factor in the survival of the colony. Over time the travelers of El Camino Real developed alternate sub-routes within the overall path. As the caravans approached Santa Fe there were three clear choices: “one gave travelers the choice of scaling the basalt behemoth [of La Bajada], another followed the Santa Fe River through the yawning canyon of Las Bocas (the Mouths), and the third required another, longer trek around La Bajada through the Galisteo Basin,” according to the National Park Service web site. 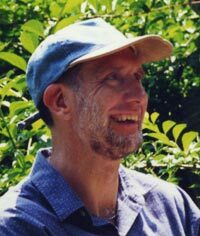 It is that third option that could cause the Royal Road to find its way through the Rancho Viejo – possibly just up the street and a few feet into the desert plains from our actual place of residence. A major reason for traveling through the Basin was the presence of the eponymous Galisteo Creek – aka Galisteo River. (We do like to overstate the size of few water sources that we have out here.) Santa Fe residents, and visitors such as soldiers of both the U.S. Cavalry and the Confederate Army during the 1800s would regularly water their horses, and themselves, at the perennial stream that flows from the eastern highlands down into the Rio Grande through Galisteo. I learned this during a one-on-one meeting I was fortunate enough to have with Dr. Eric Blinman, Director of the state’s Office of Archaeological Studies. I was asking him about possible historic and prehistoric transients through the present day Rancho Viejo property. And he pointed out that it is a “straight shot” from “The City Different” through Rancho Viejo to the Galisteo Creek. One Rancho that travelers on the Royal Road most definitely did pass through was what is today El Rancho de las Golondrinas (The “Ranch of the Swallows”) – the living history museum in La Cienega, NM at which Marsha and I volunteer. The first owner of record for this large property was Miguel Vega y Coca who acquired the land in the early 1700s. For many years y Coca’s estancia (literally “stay”) was a paraje (wayside camping spot) on the Camino Real – providing goods for trade and serving as the last stop for travelers heading north to Santa Fe, and the first for those on the southbound journey to Mexico. The paraje is mentioned explicitly by, among others, the Spanish military leader and governor, Don Juan Bautista de Anza, who he stopped there with his expeditionary force in 1780. Rancho Viejo’s part on the Royal Road does not have the same written documentation as does The Ranch of the Swallows. But sometimes all it takes for somewhere to be considered historically significant is for it to geographically come between two genuinely historic locales that historic people needed to travel between – the neighborhood shortcut (“barrio atajo”) that everybody knows about, and uses. That certainly sounds like a “possibly could have” to me. Many readers of this know that Marsha is an enthusiastic and (IMHO) quite talented knitter. So when we moved to Santa Fe and decided to volunteer at El Rancho de las Golondrinas, the Spanish Colonial living history museum in the nearby “census-designated place”* of La Cienega, it was a natural that her major “character playing role” interest was to be someone who practices the fiber arts of that historic period. Marsha has already taken her first weaving steps at El Rancho, wefting several inches on the museum’s pedal loom during the recent Fiber Fest. 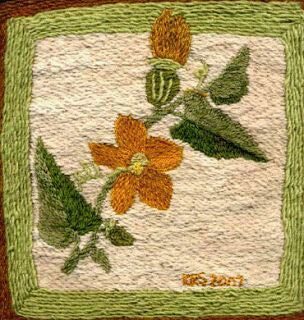 She also plans on learning colcha embroidery, which was popular from the early 1700s to late 1800s in the southwest United States. According to nordicneedle.net, “the traditional Spanish Colonial colcha designs were influenced by East Indian prints and 18th century crewel. So, the designs included flowers, leaves, birds, often with a central medallion. The stitch that became known as ‘colcha’ was a self-couching stitch [aka Convent Stitch, Klosterstitch, Span Stitch, and Spannstitch.”] I am guessing that the “East Indian prints and 18th century crewel” that influenced colcha designs must have somehow come to northern New Mexico by way of the Camino Real and/or the Santa Fe Trail, which were really the only sources of new ideas for this at-the-time really isolated part of the North American continent. While the majority of colcha embroidery was done on bedspreads made of “sabanilla”, a loosely-woven wool fabric with a 12- to 22-thread count, it also appeared frequently on runners and altar cloths. But did the Spanish knit? Indeed yes. The oldest knitted pieces that have been discovered are some intricately patterned socks (sometimes called Coptic socks) made of white and indigo cotton in Egypt around 1000 - 1400 AD. But the complexity and level of skill exhibited in these pieces of footwear clearly indicate this was not that first knitter’s first ever project. So it is likely that knitting began closer to the low end of the above date range and was an extension of an earlier fiber art known as “nålbinding” – an hand craft known to have been in existence circa 250 – 420 AD that uses a single needle and produces a very similar-looking product. Knitting likely began when an early nålbinder, possible under deadline to get that birthday present done, picked up a second needle and tada! – a brand new craft is born. To that point, the oldest European knitting relics are some detailed silk pillow covers that date to around 1275 A.D., which were found in the tomb of Prince Fernando de la Cerdo of Spain. 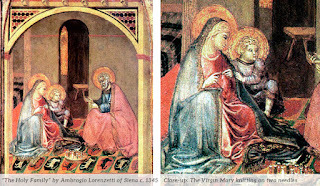 Most of the early knit objects in Spain, not surprisingly, were liturgical garments and accessories for the Catholic Church, knitted of very fine yarn and sometimes stitched with gold and silver threads. 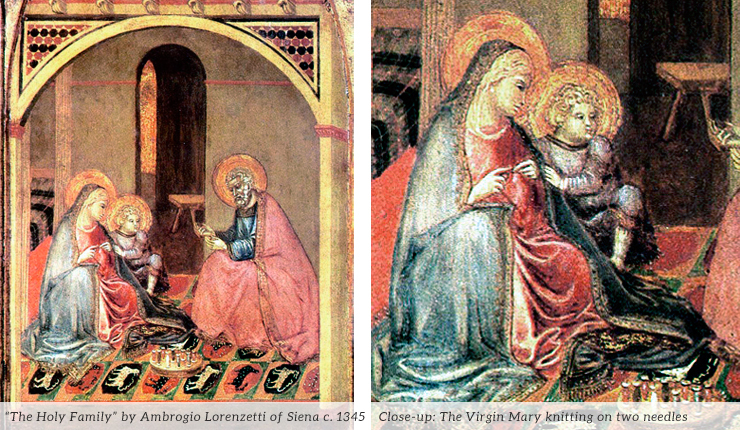 By the 14th century knitting had spread to Italy and Germany as evidenced by my personal favorite thing I discovered in this research, the “knitting Madonnas” – paintings depicted the Virgin Mary sitting beside the baby Jesus, needles in hand, slipping, purling, and decreasing. As mentioned earlier the hard-core knitters in Spain were the all-male knitting guilds that kept the Spanish men of style, in style. “Men in knee breeches depended upon elegant legs for their fashion status, and baggy stockings were a disaster,” says historian Irena Turnau. In addition to form-fitting stockings members of the guild had to demonstrate their expertise in making felted caps, embroidered gloves, shirts, waistcoats and knitted carpets. My own las Gomondrinas character is that of a “vecino” farmer or miller (depending upon where I am needed) – neither of which call for the display of my elegant legs in knee length breeches. In fact the trousers I wear are largely indistinguishable from Levi jeans but for the stiffer canvas material, button fly, and lack of belt loops. So I will not be beseeching my favorite vecina for any custom-made leg ware. Marsha has however offered to crochet a red sash to add a little color to my gray, black and white ensemble. And in return for this kind gift I am going work on finding an image of the Virgin of Guadalupe – our favorite icon (southwest or otherwise) – wefting away on a pedal mill. Or better yet perhaps convent-stiching colcha roses onto the cape of Juan Diego – the recently canonized native Mexican peasant to whom the Virgin appeared in 1531. Since moving out here we have seen Nuestra Señora de Guadalupe's image just about everywhere, e.g. tattooed onto the backs, arms, and legs of women and men – or decorating the hoods of highly polished low-rider cars. So why not doing a little colcha? When the swallows started clinging to our front door screen and looking longingly into the house we became a little concerned. We have after all, like most of you, seen Alfred Hitchcock’s movie “The Birds” – or at least some of the scarier, more ominous scenes from it. Our instinct was to go with the latter “live and let live” approach – especially since we are volunteers at an historic rancho and living history museum named El Rancho de las Golondrinas – “The Swallows Ranch.” Not to put too much faith into what could be a simple punctuation error, but we noticed it did not say “swallow’s” with an apostrophe, which would have implied avian ownership. So we figured the little golondrinas, which also have nests in various populated places around the ranch, were the type of co-residents who wouldn’t be too demanding. Before the whole screen scene we were noticing the pair of them hanging out atop a two foot tall plastic owl that came with the house and dangles from the ceiling in the outermost corner of the portal entry – about six feet from our house’s front door. The purpose of the statue as we understand it is to scare pigeons and other birds away from our garden or property. It sure isn’t decorative. Obviously however “other birds” do not include golondrinas. We couldn’t see up high enough to tell what the little guys were doing up there – but they we there, and we were here – and that all seemed just fine. Suddenly we noticed them clinging to our screen – which incidentally is not a swinging door but instead a sliding barrier that curls up into one side of the doorway when not in use, and is held in place by magnet when fully unfurled. Then, looking more carefully, Marsha realized they seemed to be coveting the dried flower and straw wreath that hung on the outside of the wooden front door itself – and, when opened, stood at a right angle to the mesh insect excluder – clearly visible and teasingly close. Perhaps that was the source of their building materials we mused. But when we ourselves looked closely at the apparent object of their affection we could see the concave beginnings of what would ultimately become a tiny mud and straw nest on the main entry to our house. This potential situation brought to mind a similar story about an aunt and uncle of Marsha’s who retired to Green Valley, Arizona that resulted in them bypassing that means of entry for the duration of the bird’s building, birthing, and ultimate empty-nesting. Not to be cruel and since the nest was far enough along to recognize its possibility but not so complete as to be yet usable, we took down the wreath. And to our relief the little house-builders seem to have simply transferred their nesting spot to the top of the head of the decoy owl – previously their on deck area – and from which they now look down less wistfully at the activities in our front entryway, and no longer need to cling like predatory home invaders eagerly waiting for their next chance. So for this summer at least, welcome to El Casa de las Golondrinas – without the apostrophe, we hope.